An unsatisfactory swim. But a v satisfactory walk. This Easter weekend the weather has been all over the shop. It was a beautiful warm sunny day on Good Friday (when I was working, natch). Saturday, Sunday, and now Monday have seen hail, sleet, sunshine and angry downpours. On Sunday we set off for the coast near Coleton Fishacre, and as we approached the sun was shining but there were black clouds threatening. We parked at Coleton Camp and made our way down past fields of sheep and January King cabbages to Scabbacombe Head. 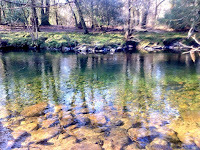 We headed towards Pudcombe, because I wanted to try swimming at Ivy Cove, where fellow blogger Chris likes to go. Well that proved quite challenging as it involved quite a bit of rock climbing, and there were strong winds and a rough sea so in the end I wimped out. I was determined to get a swim though, so we decided to walk back to Scabbacombe Sands, via a different lower path. This turned out to be quite a detour as there were numerous hairpin bends, but it was all worth it because we saw a gannet. Miracle of miracles I had my binoculars with me and so got an amazing view of it bombing along parallel to the shore, beating its great ink-dipped wings It was a steep slide down a muddy field to the beach. As I was getting ready to swim somebody up there decided to go apoplectic, hurling down rods of rain. So it was a quick dash to the water and a skinny dip, but the swell was considerable, and I wasn't wearing shoes, and kept slipping on rocks underfoot, so didn't manage to get properly submerged. Some days things just aren't meant to be. It was a beautiful walk on a stunning bit of coastline though. Oh, and we saw a seal. We're having lots of spring-like sunny weather this week, and when I went to swim in the Dart with Yaara on Monday afternoon we were astounded by the zingy-green clarity of the water. The river doesn't often look like this, and from memory, it seems to be like this only at this time of the year. Sometimes it's like lime soda, today it was more of a minty green. 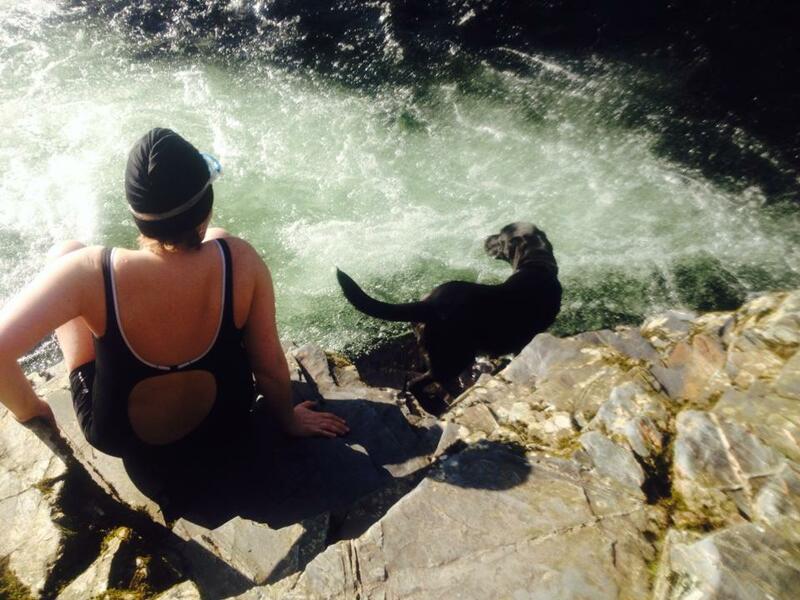 As we plunged in, with the sun sparkling through the water, we felt completely alive. Gingerly, we put our faces in and the view below was equally invigorating: an underwater landscape of green and grey rocks, seemingly scrubbed clean of any dirt. 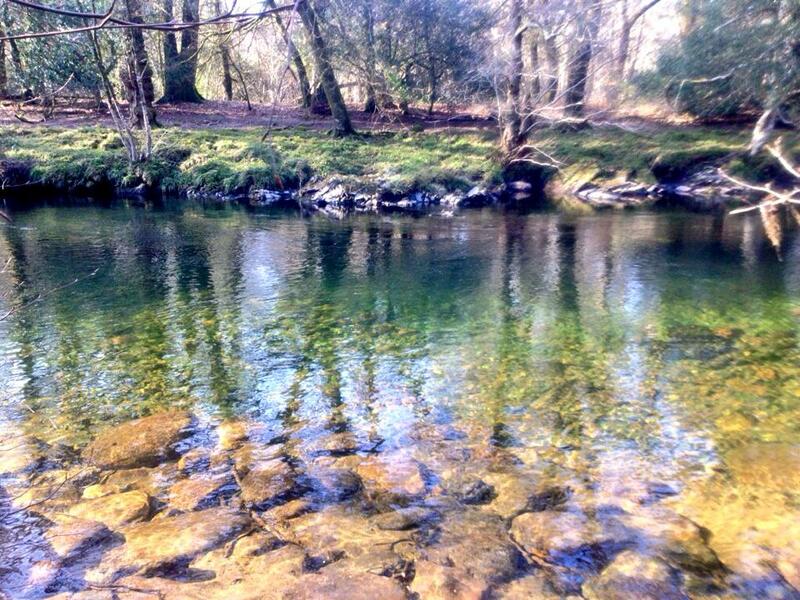 I remembered Sharrah Pool looking like this once, and looking back at my photos I see that this was in February 2014, Perhaps all the rain washes the riverbed clean towards the end of winter, and then when the sun comes out in Spring it lights it up in all its new freshness. 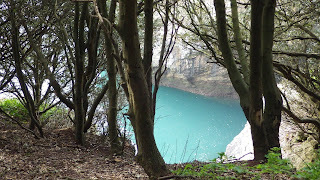 As we walked down the coastpath from Daddyhole Plain in Torquay, the view out to sea was hazy and almost eerie. The sea was glassy and flat calm, and everything seemed rather blurred and dreamlike As we got nearer the water, we got a sudden glimpse through the trees of petrol-blue water. Having made our way down through the sadly neglected and rubbish-strewn gardens above Peaked Tor Cove, we changed in the sun before setting out on our aquatic adventure to London Bridge, a natural arch that just cries out to be swum through. The water was calm, clear and beautiful, and we swooshed through the channel between Saddle Rock and the coastline, before heading towards the majestic arch, which we swam underneath. Out the other side, we swam further along the coast to a cave where the water gurgled in the crevices. Thanks to Carole Whelan for the pictures.